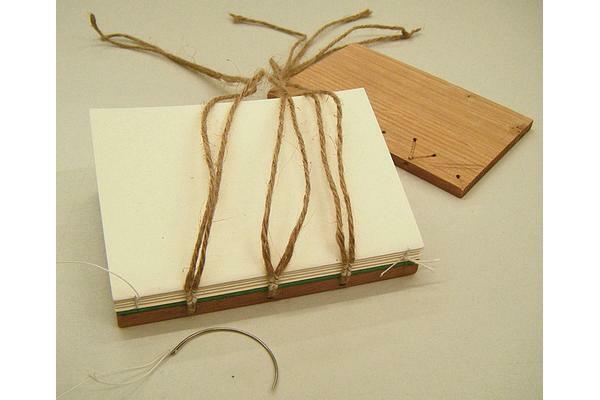 In November 2013 the postgraduate book students visited Camberwell College of Arts for two weekends of historical binding with Jürgen Vervoorst. 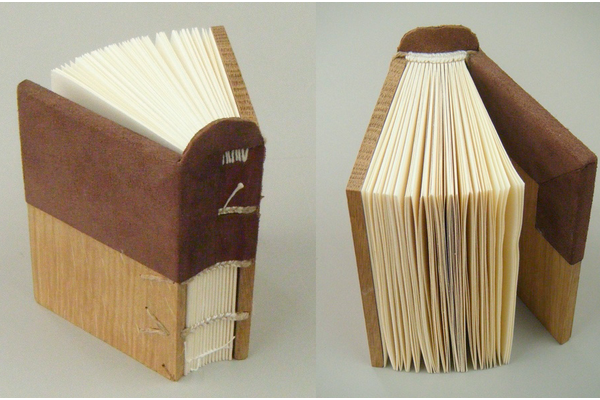 Over the four days, we attempted to create cutaway models of two different styles of binding: the Carolingian and the Gothic. 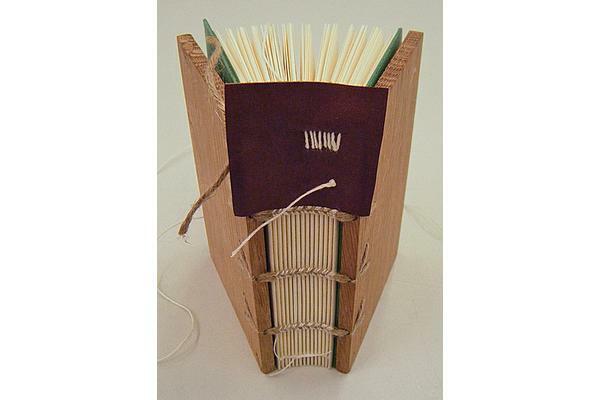 I began with the Carolingian style, a binding used from the 8th to 12th centuries in Europe, and named after the Frankish dynasty. 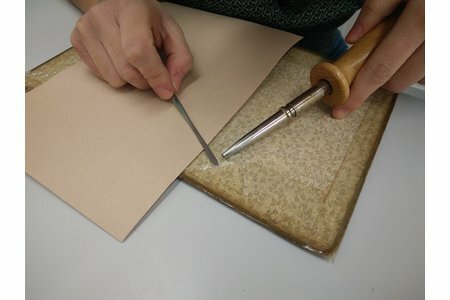 Whilst original Carolingian books would have been written on parchment, paper was used for the model, and it had been kindly pre-cut and folded for us. 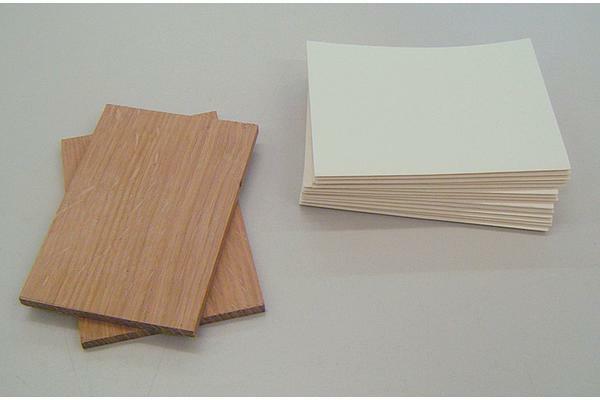 The boards were oak, one of several woods which may have been used on Carolingians, others being beech or poplar. 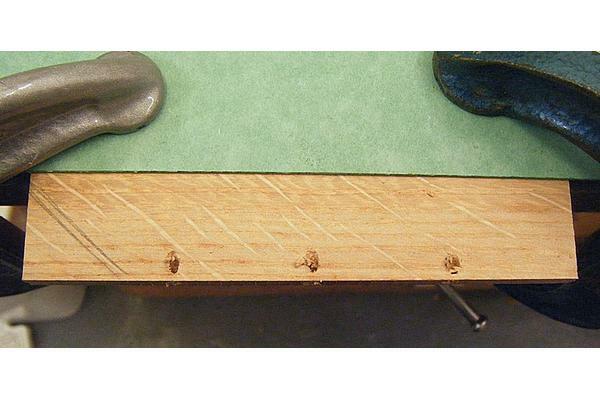 Ideally, whatever wood is used for boards, it should be quarter-sawn to reduce the risk of warping, as the tree-rings run across the thickness of the board, rather than along its length. 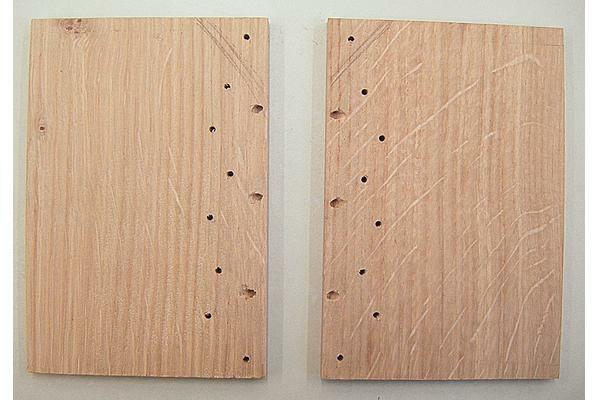 The first step was to drill holes in the edges of the boards for the sewing supports. 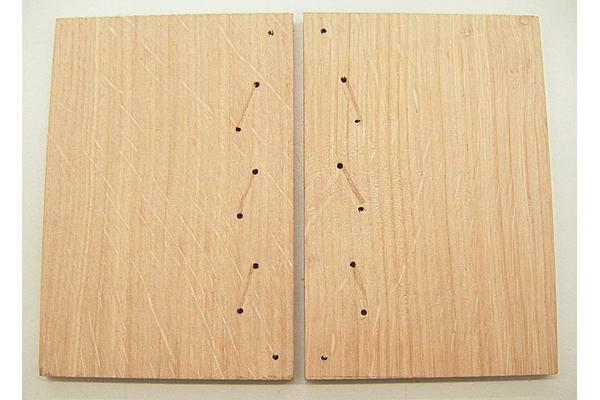 These holes enter the board in the middle of the edge and travel diagonally towards the outer surface of the board. For this I used a hand drill with a 3 mm drill bit, making the hole just large enough to take two cord supports. Three of these were drilled, spaced as seen below. Next, I cut channels between the holes, along the path the cord supports will take as shown below. 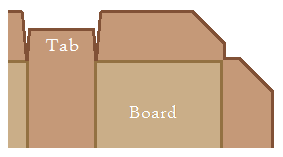 Once the boards were finished, I lined them up with the textblock, so that I could mark for sewing stations. 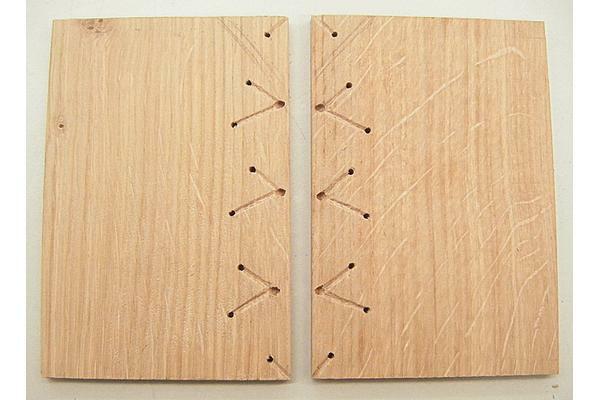 Instead of slicing the sewing stations into the spine, or pricking them with a needle or awl, I used a French paring knife and rolled the curved blade over the spine, applying enough pressure to just cut a short distance into the spine edge of the sections. 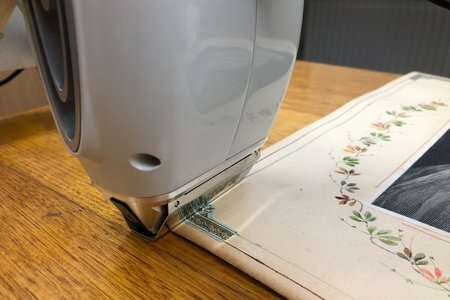 I am uncertain as to whether there is any advantage of this method to the binding, but it was novel to me and I felt it deserved a mention. For the next step, I laced the cords through the front board, so that each end of the support went through one of the smaller holes and then both ends went through the larger hole and out the spine edge. The cord should follow the channels all the way, as below. Next, I sewed the sections to the cord supports using a herringbone stitch. I left the green waste board in during sewing, as the covering leather would be fairly thick and so extra space would be needed between the board and the textblock. I then laced the loose ends of the cords through the back board. 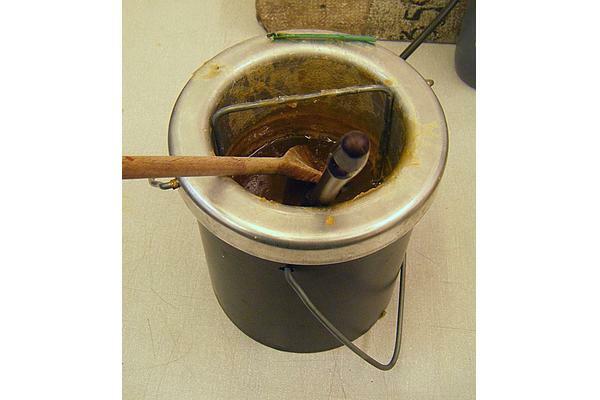 Finally, I twisted them together and glued them into the inside channel with animal glue. 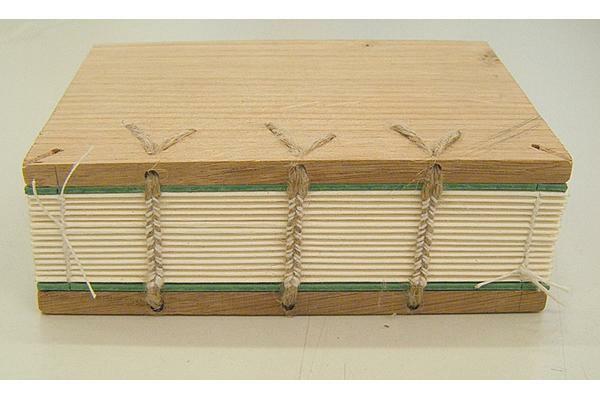 Endbands on Carolingian bindings are worked through a leather tab lining. 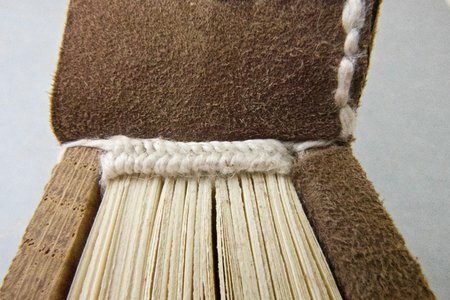 For my binding, I cut a piece of leather slightly wider than the spine (this extra can be trimmed later), and long enough that it extends from the endmost cord support to about 20 mm out from the head end. 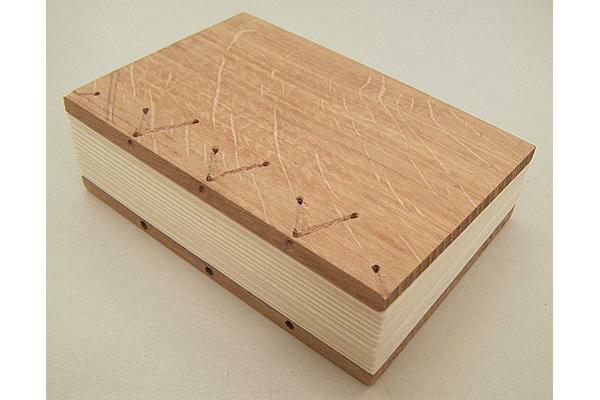 This I attached flesh side down to the spine of the book, using animal glue. For the endband itself, I used packed herringbone sewing. 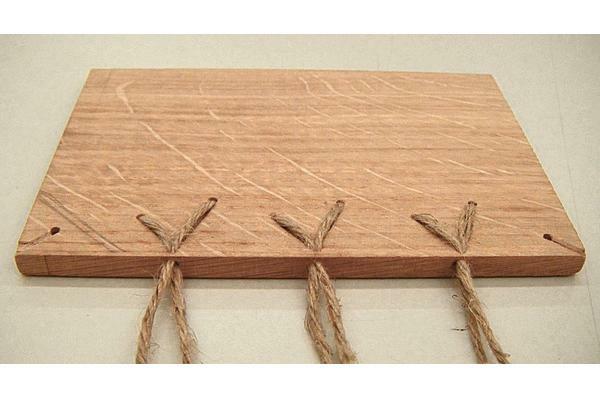 The core was a linen cord, looped through the front board and tied into the back board, at the holes in the corners, to form a double support. The tied cord is not glued in until after sewing. 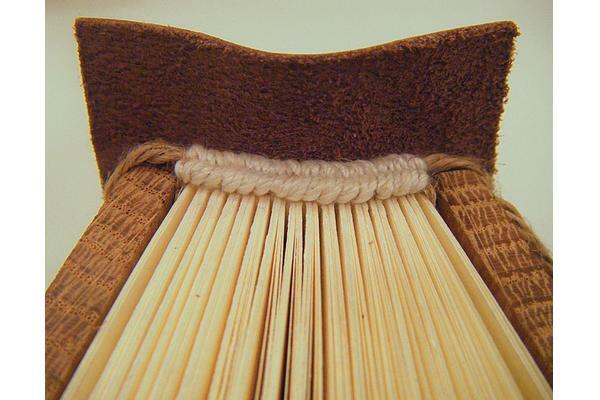 As shown in the picture below, the thread enters the first section through the tab lining and the spine, partway between the endmost cord support and the kettle stitch, and is tied off on the outside. It then exits again through the kettle stitch hole and the tab. Finally it pierces the tab again just underneath the endband cores. Each tie down repeats the pattern, exiting through the kettle stitch and entering the tab under the endband. 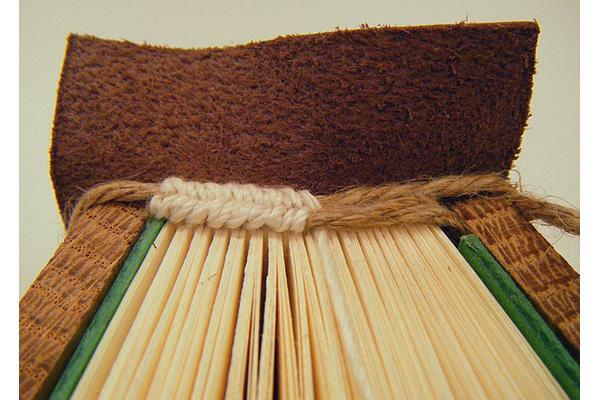 Before covering, the same leather is used to line the spine between the cord supports, and these linings and the tab are trimmed to the width of the spine. 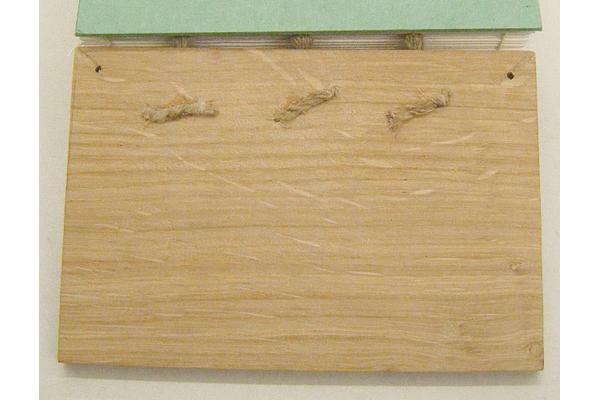 As a cutaway model, my binding only has the top half lined. The cover is then measured and cut to provide a relatively large turn in, and to allow the spine covering to form the back of the endband tab (rather than turning the spine in as well). 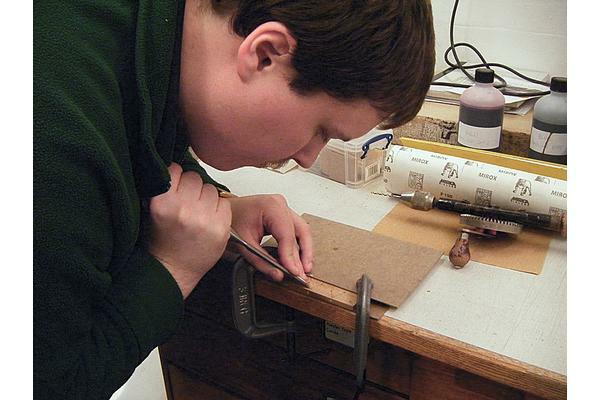 Bear in mind the thickness of the boards when cutting the leather to turn in at the corners, simply cutting at a diagonal will either leave board exposed or have too much leather overlapping. This is then pasted up and adhered to the book as usual. Again, as a cutaway model, I have only covered half of one board.